Pineapple fruit designs are popping up everywhere and that certainly includes at summer baby showers. Most of the fresh little pineapples for baby are super cute. Some have funny faces, while others, like the one I've chosen to show you today is simply chic and filled with whimsy. 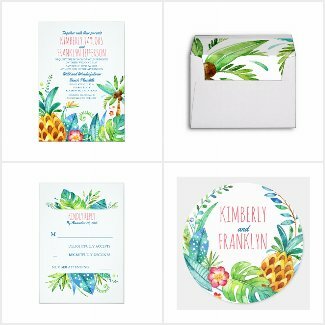 Today'sOne Amazing Invite is a gorgeous watercolor pineapple design that has a fun teal color theme with palm trees, coconuts, fronds, and pretty tropical flowers. And it's not just for a Pineapple theme baby shower, no sir. This design would also be perfect for a beach, tropical, or fruit-filled baby shower. In fact, it would work well for any summer baby shower being held inside or out, but of course if you please, you can use this fun pineapple theme all year long. This invite measure 5" x 7" and comes with an envelope and Zazzle's 100% satisfaction guarantee. Learn more and/or order your Pineapple Baby Shower Invites here. This amazing watercolor pineapple design is also available on several matching items and for other occasions. Visit the Tropical Pineapple Collection to see them all. I found this funPineapple Decoration set at Amazon that looks like it would be a great addition to the party. If the parents-to -be love fishing, this fun fishing lure baby shower invitation would be just the thing to O-FISH-ALLY invite friends and family to celebrate the coming arrival of their little tadpole. The adorable fishing baby shower design features three brightly colored fishing lures hanging from a line across the top of the invite. All of the personalized information sits in the center or a white badge with a gray border. The background looks like blue weathered wood which also appears on the flip side of the invite. This 5" x 7" invitation also says, Take the bait and celebrate! Because of all the blue they're probably best to use for a boy but really they're quite gender neutral. They're easy to personalize and each invite comes complete with a white envelope and Zazzle's 100% satisfaction guarantee. This invitation is part of our new ONE AMAZING INVITE collection where we highlight one amazing shower invitation each day.